Centuries ago, a magical plague swept across the island of Jakandor and struck down the majestic Charonti civilization. A Golden Age of learning, art, and magic was lost in a period of days as the magically based culture that the wise and gentle Charonti people had developed collapsed around them. The few Charonti who survived learned to adapt to the new world; the wizards mastered necromantic arts that allowed the fallen victims of the plague to continue to serve the new Charonti culture as a manual labour force. After a period of vicious civil war, the nation has now united under a fair and benevolent queen. The Charonti people seek to regain their lost magic and their lost empire - but as they explore the island seeking ancient cities that have been swallowed by the wilderness, they find that their ancestral home has been invaded. In this, the second of the three-part Jakandor series of products, the history, culture, politics, religion, cities, attitudes, and magic of the Charonti people - a nation of wizards - is fully detailed for the first time. 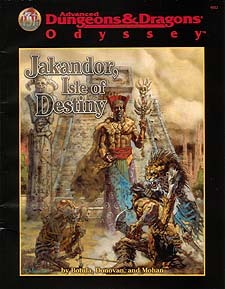 Included in this package is all the information needed to run Charonti PCs in a full-fledged Jakandor camapign, including a colour map of Jakandor. The Charonti's unique magic system is also detailed with new kits and new spells for Charonti PC wizards.